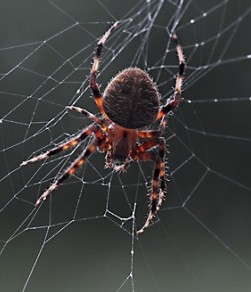 Jennifer, author of The Daily Compost, recently asked for permission to use my image of a Neoscana spider to illustrate her recent post— Giant spiders: one more reason I love fall. Go check out her great blog and see. Thanks for the shout out and showcasing my photo, Jennifer! When my friend Karen and I go down to her lakehouse, we always feel compelled to bring our sewing machines and make something. In fact, we both agree we can’t really sew anywhere but the lake now. We’re spoiled! We put up my folding table on the screen porch and spread all our fabric around and get going. Her house overlooks the lake, so we can watch egrets and herons landing and taking off, kayakers rowing and fishermen trolling, and giant carp fins circling around like something out of Jaws. No phone calls, no interruptions. Snacks and music always. I ask you how sewing in a kitchen townhouse can possibly compare to sewing on a screen porch overlooking a lake! 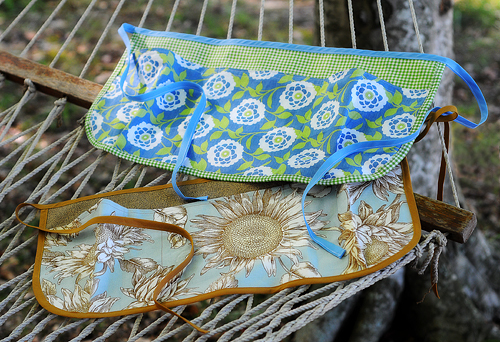 When we started sewing at the lake, we started making curtains (no pattern, just winging it!) for the patio doors and shams and coverlets for the twin beds in one room. This year we spent Labor Day down there, sewing machines in tow. I was inspired to copy a cheapie dollar store gardening apron. I made three aprons that afternoon. Karen is using the blue one in her skin care salon. They’re a lot of fun to create (and a quick project, too!) and I might even try selling some on Etsy…you know, in my spare time. Ah, something else to keep me busy in the winter (besides crocheting a gazillion hats that I don’t need) when I can’t be out photographing my beloved flowers. Abbie and Todd got married at the Sayen House and Gardens in Hamilton, New Jersey on September 12 and I was hired as their official photographer. These are just a fraction of the many photos I’ve been working on (happy one week anniversary today, you two!). The ceremony was originally supposed to take place in the Temple Garden under a gazebo but the weather wouldn’t cooperate. Just after the ceremony, it stopped raining and we were able to do my much-anticipated photo shoot in the garden. Everything was intensely green because of the rain, so that was a definite plus! I’ve got a lot more to prepare, but wanted to share this compilation on my blog because it does have a connection to gardens. Enjoy! I just added more photos to the Green Spring Gardens-only gallery on my Zenfolio site. Click on this link here to view all 191 photos in thumbnail size. If you double-click on a photo, it will enlarge and a sub-gallery will show on the right side of the screen. You can also select “slide show” at the top. I hope you enjoy viewing them as much as I did photographing them! Every fall, I am sadly aware that there will be less and less flowers blooming for me to capture (and in case you hadn’t noticed, it is a passion for me), but the light is always exquisite when I do find a subject to immortalize in pixels. I was drawn to this Mallow flower mostly because of the light behind it, which with a large aperture, morphed into this dreamy soft background with lovely bursts of chartreuse and the rusty browns that fall brings. 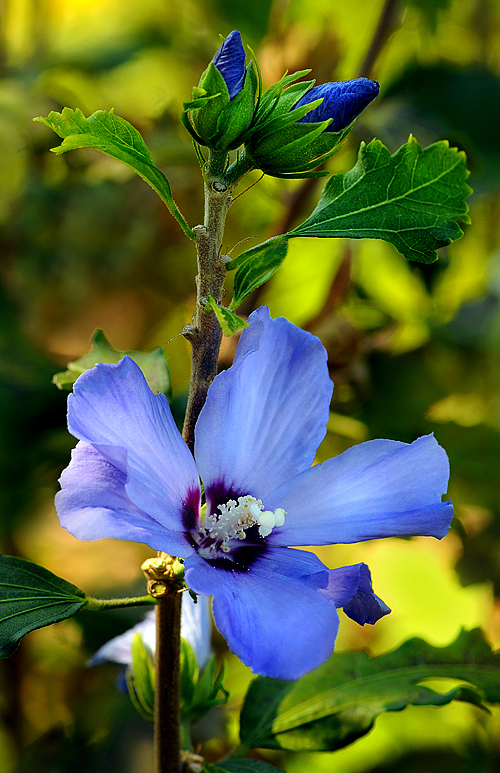 I’m sure this flower is in the Mallow/Hibiscus family; I just don’t know what variety it is. Anyone? 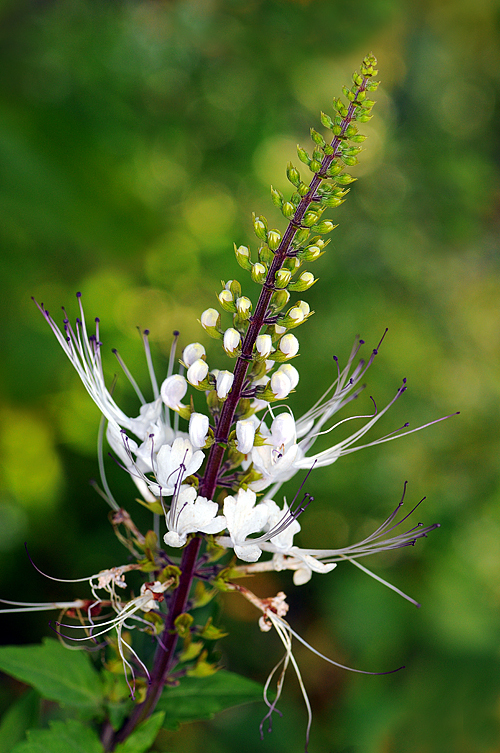 Part of the mint family, Cat’s Whiskers are herbaceous perennial flowering plants originating in tropical East Asia. They grow up to two feel tall and three to four feet wide. The flowers have an orchid-like appearance and are white or lavender, sprouting long stamens that resemble cat’s whiskers. They attract butterflies and hummingbirds and can be harvested to use in herbal teas. I photographed this plant at Green Spring Gardens in Alexandria, Virginia. This is the view I had outside the front door this morning—more than 100 beautiful blue blooms on my ‘Heavenly Blue’ Morning Glory vine (and many more buds yet unfurled). I didn’t plant any seeds this year, but apparently seeds from last year’s vine thrived this year! And can you spot the “bonus bug” coming in for a landing in the top shot? I didn’t see him until I zoomed in on the image in Photoshop.